HP AlphaServer DS25 is a high performance server for business and telecommunications applications at an affordable price. HP AlphaServer DS25 designed to give you power and expandability in a space-saving package that packs a big punch, with up to two 1.0 GHz Alpha processors and 16 GB of memory for crucial business and telecom applications. 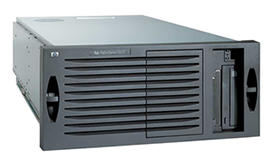 HP AlphaServer DS25 is a perfect upgrade choice for HP AlphaServer DS20E owners, using the same power and packaging while dramatically extending the computing capacity for a two-processor AlphaServer system.